The French Army of 1914 was a truly massive one; the infantry alone numbered 173 separate regiments each made up of 3000-4000 men. It was armed with one of the best field guns in Europe – the 75mm – and it’s soldiers carried a powerful 8mm Lebel rifle. The soldiers – who would quickly become known as the Poilu – were all conscripts who would spend most of their adult life committed to French military service; first as full-time regulars, then reservists and finally as territorials. While the Poilus weapons were modern, his tactics and uniforms were not. 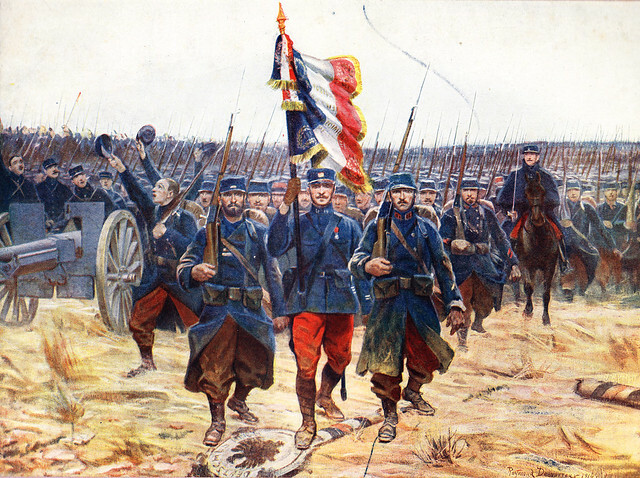 As can be seen in this contemporary image from 1914, showing a French infantry regiment marching to war, the men are wearing uniforms that have changed little since the Franco-Prussian War of 1870-71. The men wear bright red, somewhat conspicuous, trousers and blue serge tunics. They advance en-masse with their officer at the front and the flag flying. While this is obviously an illustration the facts reflect the awful truth; that while France was prepared for war in 1914, it was not prepared for the Great War. By the 31st December 1914, just five months of conflict, France had lost more than 300,000 men killed on the battlefield; nearly a fifth of their loss for the entire war. Troops in column easily visible to an enemy with powerful artillery and a large number of machine-guns stood little chance, something the casualty figures reflect. But as will be seen on Wednesday, despite or perhaps because of these losses, France was one of the first combatant nations to truly adapt to the conditions of trench warfare. This entry was posted on 30/04/2012 by sommecourt. It was filed under French Army, French Front, Great War, Western Front, WW1 and was tagged with 1914, France, French Army, Poilu. I was just wondering where you referenced this photo from? It’s from an original print in my collection.